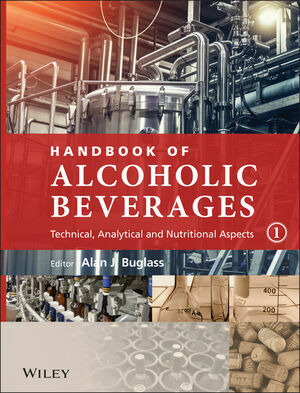 A comprehensive two- volume set that describes the science and technology involved in the production and analysis of alcoholic beverages. At the heart of all alcoholic beverages is the process of fermentation, particularly alcoholic fermentation, whereby sugars are converted to ethanol and many other minor products. The Handbook of Alcoholic Beverages tracks the major fermentation process, and the major chemical, physical and technical processes that accompany the production of the world’s most familiar alcoholic drinks. Indigenous beverages and small-scale production are alsocovered to asignificant extent. The overall approach is multidisciplinary, reflecting the true nature of the subject. Thus, aspects of biochemistry, biology (including microbiology), chemistry, health science, nutrition, physics and technology are all necessarily involved, but the emphasis is on chemistry in many areas of the book. Emphasis is also on more recent developments and innovations, but there is sufficient background for less experienced readers. The approach is unified, in that although different beverages are dealt with in different chapters, there is extensive cross-referencing and comparison between the subjects of each chapter. FERMENTED BEVERAGES: BEERS, CIDERS, WINES AND RELATED DRINKS: the latest innovations and aspects of the different fermentation processes used in beer, wine, cider, liquer wines, fruit wines, low-alcohol and related beverages. ANALYTICAL METHODS: covering the monitoring of processes in the production of alcoholic beverages, as well as sample preparation, chromatographic, spectroscopic, electrochemical, physical, sensory and organoleptic methods of analysis. NUTRITION AND HEALTH ASPECTS RELATING TO ALCOHOLIC BEVERAGES: includes a discussion on nutritional aspects, both macro- and micro-nutrients, of alcoholic beverages, their ingestion, absorption and catabolism, the health consequences of alcohol, and details of the additives and residues within the various beverages and their raw materials. Alan J Buglass graduated with BSc from the Chemistry Department of the University of Nottingham in 1968 and then with PhD from the Chemistry Department of the University of Essex in 1972. After a number of junior teaching and post-doctoral appointments, including one at Imperial College with Dr. B.C. Challis, he took up a teaching post at the present Anglia Ruskin University (ARU) from 1974 to 2002, where he was subsequently promoted to a senior post. At ARU, he was course leader for some chemistry courses, such as part-time Graduateship of the Royal Society of Chemistry, designed primarily for personnel in local chemical industries. Since 2002, he has been a professor at Korea Advanced Institute of Science and Technology (KAIST). His present research interests are in mechanistic organosulfur chemistry and analytical organic chemistry, particularly the analysis of wine (and similar) components, both volatile and non-volatile. He is a Fellow of the Royal Society of Chemistry (since 1995). He has published extensively including papers on analysis of wine, organic compound content of grapes in English vineyards, etc. 1 INTRODUCTION, BACKGROUND AND HISTORY (John A. Hudson and Alan J. Buglass). 1.1 Alcoholic Beverages of theWorld: An Introduction to the Contents of This Book. 1.2 History and Development of Alcoholic Beverages. 1.2.1 The Beginnings (From the earliest Times to ca. 1100 AD). 1.2.2 Medieval Times and Beyond (ca. 1100–1750). 1.2.3 The Industrial Revolution and the Influences of Science and Technology (ca. 1750–1900). 1.2.4 Modern Times and Newer Processes (ca. 1900–Present Day). 1.2.5 The Development of Analytical Methods. 1.3 Some Recent Trends and Developments. 1.3.2 Big is Beautiful: Multinational Companies and the Globalization of Alcoholic Beverages. 1.3.3 Small is Beautiful: The Growth in Microbreweries and Craft Breweries and the localization of Products. 1.3.4 Revival of Traditional Beer Styles. 1.3.5 Changes in Beer Drinking Habits. 1.3.6 Global Growth in Wine Drinking. 1.3.7 Development of New Wine Industries. 1.3.8 Revival of Cider and Perry: the Magic of Ice. 1.3.9 The Rise of Flavored Alcoholic Beverages (‘Alcopops’). 1.3.10 Calorie-Counting and Health Perception of Alcoholic Drinks. 1.3.12 Organic and Biodynamic Production of Alcoholic Beverages. 1.3.13 Use of Genetically Modified (GM) Crops and Microorganisms. 2 FERMENTED BEVERAGES: BEERS, CIDERS, WINES AND RELATED DRINKS (Marianne McKay, Alan J. Buglass and Chang Gook Lee). 2.1 Introduction: Overview of Fermentation and Microorganisms. 2.1.3 Molds and Spoilage Organisms. 2.2.2 Physiology and Morphology of Yeast. 2.2.3 Nutritional Requirements of Yeast. 2.2.4 The Use of Naturally Occurring (‘Wild’) Yeasts in Fermentations. 2.2.6 The Use of Selected (Cultured) Yeast Strains. 2.2.8 The Growth of a Yeast Population. 2.2.9 An Overview of Alcoholic Fermentation. 2.2.11 Aroma Compounds and Fermentation. 2.3.2 Malolactic Bacteria: Morphology and Physiology. 2.3.3 Identification of Malolactic Bacteria. 2.3.4 Factors Affecting the Growth of Malolactic Bacteria. 2.3.5 Interactions Between Bacteria and Other Organisms. 2.3.7 Inoculation with MLB Starter Culture. 2.3.8 The Growth of Bacterial Populations. 2.3.9 The Malolactic Fermentation Process. 2.3.13 Finishing and/or Preventing Malolactic Fermentation. 2.3.14 Production of Biogenic Amines by Malolactic Bacteria. 2.3.15 Other Effects of MLF. 2.3.16 Malolactic Fermentation and Aroma. 2.4 Acetic and Other Fermentations. 2.4.4 The Activities of Yeasts other than Saccharomyces. 2.5 Preservatives Used in the Production of Alcoholic Beverages. 2.5.3 The Roles of SO2. 2.5.6 Ascorbic Acid (Vitamin C). 2.6.1 The Basic Brewing Processes. 2.6.8 Modern Methods of Fermentation. 2.6.9 Beer Treatment: Fining, Filtration and Pasteurization. 2.6.10 Packaging of Beer: Casking, Kegging, Bottling and Canning. 2.6.11 Dispensing of Draught Beers. 2.6.12 Oxidation and the Staling of Beer. 2.7 Cereal-based and Other Fermented Drinks of Asia, Africa and Central/South America. 2.7.1 The Rice ‘Wines’ of Asia. 2.7.2 Native Fermented Drinks of Africa and South America. 2.8.3 Harvesting, Crushing and Pressing. 2.8.5 Traditional and Small-Scale Cider and Perry Production: Fermentation and Beyond. 2.8.6 Large-Scale (Factory) Production of Cider and Perry: Fermentation and Beyond. 2.8.7 Newer Techniques, Recent Developments and Innovations. 2.8.8 Cider and Perry from Around the World. 2.9.4 Fining, Filtration and Clarification. 2.9.5 Wine Maturation and Ageing. 2.9.6 Some Current Trends in Wine Production. 2.10 Fortified Wines and Liqueur Wines. 2.10.2 Sherry and Other Flor Wines. 2.10.3 Flor and Oxidation in Sherry Wines. 2.10.6 Estufagem and Cask Maturation of Madeira Wine. 2.10.9 Vins Doux Naturels, Liqueur Muscat and Similar Wines. 2.10.10 Vins de Liqueurs and Similar Beverages. 2.11 Fruit Wines and Other Nongrape Wines. 2.11.2 Comparison of Fruit for Winemaking. 2.12.1 Introduction and Brief History of Aromatization of Wine. 2.12.3 Other Aromatized Wines and Apéritifs. 2.13 Low Alcohol and Non-Alcoholic Beers, Ciders and Wines. 2.13.2 Production of Low Alcohol Beverages by Limited or Checked Alcohol Methods. 3 DISTILLED SPIRITS (Alan J. Buglass, Marianne McKay and Chang Gook Lee). 3.1 Introduction: Distillation Methods and Stills. 3.1.1 A Brief History and Theory of Distillation. 3.2.1 Introduction and Brief History. 3.2.3 Malting, Mashing, Cooking and Fermentation. 3.2.5 Maturation, Blending and Other Postdistillation Processes. 3.2.6 The Flavor and Styles of Scotch Malt Whiskies. 3.3.3 The Whiskeys of America. 3.3.4 Bourbon and Tennessee Whiskey. 3.3.5 American Rye and Corn Whiskies. 3.3.6 Whiskies from Other Countries. 3.4 Other Cereal Based Spirits. 3.4.2 Gin and Similar Juniper Flavored Spirits. 3.4.3 Akvavit (Aquavit) and Vodka. 3.5 Cane Spirits, Vegetable Based Spirits and Aniseed Flavored Spirits. 3.5.2 History and Basic Description of Rum and Cachaça. 3.5.3 Fermentation and Distillation Practices in the Production of Cachaça and Rum. 3.5.4 Flavor Characteristics of Rum and Cachaça. 3.5.5 Arrack, Mezcal and Tequila. 3.6.1 Introduction and Brief History. 3.6.5 Quality Control in Brandy Production. 3.7 Grape and Other Pomace Spirits. 3.7.2 Production of Pomace Spirits. 3.7.3 Types of Pomace Spirits and Sensory Characteristics. 3.8.2 Apple and Pear Spirits. 3.8.3 Fruit Spirits of Central Europe. 3.8.4 Plum Spirits of Eastern Europe. 3.9 Liqueurs and Their Flavorings. 3.9.2 Fruit and Fruit Flavored Liqueurs. 3.9.3 Flower, Herb, Spice and Bitter Liqueurs. 3.9.4 Cocoa, Coffee and Tea Liqueurs. 3.9.5 Nut and Emulsion Liqueurs. 3.9.6 Production and Use of Essences and Concentrates. 4 ANALYTICAL METHODS (Alan J. Buglass and Darren J. Caven-Quantrill). 4.1.1 Why Analyze Alcoholic Beverages? An Overview of the Need for Analysis. 4.1.3 Identification of Origin, Determination of Authenticity and Detection of Fraud. 4.1.4 Determination and Characterization of Beverage Components and Processes. 4.1.5 Development of New Analytical Methods. 4.2 Extraction and Focusing Methods in Sample Preparation. 4.2.4 Solid Phase Extraction and Related Methods (Sorption Techniques). 4.2.6 Combinations of Methods (With Particular Application to Enological Products). 4.3.1 Thin Layer Chromatography and Related Methods. 4.3.4 Counter Current Chromatographic Methods. 4.4.1 Nuclear Magnetic Resonance . 4.4.3 Colorimetry, UV-Visible Spectroscopy and Fluorometry. 4.4.4 Atomic Absorption and Emission Spectroscopy. 4.6.3 Chemical and Physical Methods. 4.7.3 Odor Theshold, Odor Activity and Low Impact Odorants. 5 NUTRITIONAL AND HEALTH ASPECTS (Nigel J. Fuller, Suk Hean Lee and Alan J. Buglass). 5.1.2 The Extent and General Implications of Alcoholic Beverage Consumption. 5.1.3 Ingredients, Processing and the Nutrient Content of Alcoholic Beverages. 5.2 Factors Influencing the Nutrient Content of Alcoholic Beverages. 5.3 Macronutrient Content of Alcoholic Beverages. 5.3.4 Nitrogenous Compounds: Proteins, Peptides, Amino Acids, Amines and Nucleotides. 5.4 Micronutrient Content of Alcoholic Beverages. 5.4.2 Electrolytes and Functional Elements (Minerals and Trace Elements). 5.5 Alcohol Ingestion, Absorption and Catabolism: Metabolic and Nutritional Consequences. 5.5.3 Effects of Alcohol on Intake of Foods and Energy. 5.5.4 Consequences for Intermediary Metabolism of Alcohol Catabolism. 5.5.5 Effects of Alcohol and its Metabolites on Absorption, Metabolism and Utilization of Key Nutrients. 5.6 Health Consequences of Alcohol Intake. 5.6.1 Overview: Alcoholic Beverages and Society. 5.6.2 Harmful Effects of Excessive Alcohol Intake. 5.6.3 Possible Benefits of Low to Moderate Consumption of Alcoholic Beverages. 5.7 Carbohydrates in Alcoholic Beverages and Health. 5.8 Antioxidant Value of Alcoholic Beverages. 5.8.2 Summary of Aerobic Cell Metabolic Processes. 5.8.3 Short Review of Oxygen in Cell Metabolic Processes. 5.8.4 Incomplete Reduction of Oxygen, the Formation of Reactive Oxygen Species and Cell Damage. 5.8.5 Natural Antioxidants in Food. 5.8.6 Phenolic Substances in Alcoholic Beverages. 5.8.7 Some Chemical Characteristics of Phenolic Compounds. 5.8.8 Health Benefits and Antioxidant Potency of Alcoholic Beverages, their Phenolic Extracts and their Individual Phenolic Components. 5.8.9 Mechanisms of In Vivo Health Benefits of Dietary Phenols: Antioxidants or Otherwise? 5.9 Additives in Alcoholic Beverages. 5.9.2 Sulfur Dioxide and Other Preservatives. 5.9.3 Fining Agents and Adjuncts. 5.9.5 Regulations and Legislation Relating to Additives. 5.10 Residues in Alcoholic Beverages. 5.10.3 Metal and Nonmetal Residues. 5.11 Other Trace Substances in Alcoholic Beverages. Appendix 1 Units of Measurement and Interconversions. Appendix 3 Pressure and Temperature Unit Conversions, and Numerical Values of Constants.